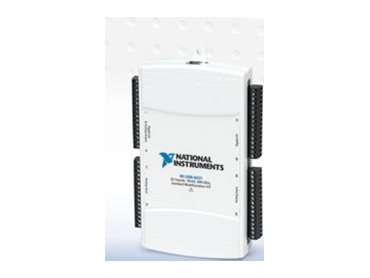 National Instruments has released two new high-performance M Series multifunction data acquisition (DAQ) devices for USB. With the new NI USB-6221 and USB-6229 DAQ devices, which provide up to 32 analogue inputs with a 250 kS/s single-channel sampling rate, NI has extended its USB DAQ offering to 40 devices. The complete NI USB offering now includes low-cost devices, high-speed devices featuring 1 MS/s sampling speeds and modular USB data acquisition systems for low-, mid- and high-channel-count applications. The USB-6221 and USB-6229, as well as bus-powered and other high-performance USB DAQ devices, feature NI signal streaming technology, which utilises the bandwidth and performance of hi-speed USB technology to allow bidirectional high-speed transfer of data between the USB device and a computer. NI signal streaming technology makes it possible to acquire and generate multiple analogue and digital I/O signals simultaneously. Because the technology relies on message-based rather than register-based configuration, much of the configuration takes place on the device, avoiding unnecessary USB transfers. Engineers can stream more synchronous analogue and digital data for data-intensive applications than is possible using USB DAQ devices alone. Additionally, with the plug-and-play connectivity of USB, engineers and scientists have an easy-to-use, portable solution for their measurement, monitoring and control applications. The USB-6221 and USB-6229 DAQ devices offer many features equivalent to their PCI M Series counterparts. The new devices include up to 32 16-bit, 250 kS/s analogue input channels; four 16-bit, 833 kS/s analogue output channels; 48 digital I/O channels with up to 32 clocked at 1 MHz; and two 32-bit counter/timers, all backed by M Series technology including a low-noise NI-PGIA 2 amplifier and NI-MCal, a third-order calibration methodology correcting for gain, offset and nonlinearity errors at all input ranges. Additionally, National Instruments USB DAQ devices have software support for both programmers and non-programmers. Each device is shipped with free data-logging software to help users take full advantage of the ease of use and plug-and-play capabilities offered by USB by shortening time to measurement. For programmers, NI-DAQmx driver software and measurement services, a powerful suite of data-logging tools, configuration management and wizard-like development interfaces, can dramatically decrease the hidden costs of software development, system setup, configuration and calibration time. The driver software features multidevice synchronization, automatic code generation and a high-level, open API that offers the same programming environment across devices and programming languages. NI-DAQmx can control every aspect of a data acquisition system, from configuration to application development. The software driver works with National Instruments LabVIEW, LabWindows/CVI, Measurement Studio and SignalExpress, as well as C/C++/C# and Microsoft Visual Basic and Visual Studio .NET languages.